Just recently, Ben & Jerry’s unveiled ‘Snackable Cookie Dough’ that lets you skip right to quite possibly the best part of its offerings. If you’re craving ice cream, though, you might want to scoop up its latest option. Teaming up with Scotland-based Bross Bagels, the brand has unleashed the “first” range of ice cream-filled bagels in London for a limited time. Ben & Jerry’s knows what’s up: bagels are #BaeGoals. The wittily-named ‘Ice-Ice Bagels’ arrive in two fair-trade variations: ‘Birthday Bagel’ and ‘Holey Cara-moley’. The first sees Ben & Jerry’s new ‘Birthday Cake’ flavor—which is made with vanilla cake batter ice cream, cake chunks, pink frosting, strawberry swirls—encased with a soft and chewy pink bagel. To bring the party to your tummy, the ice cream is decked in rainbow sprinkles. ‘Holey Cara-moley’ is set to excite fans who hanker after all things sweet and savory. It starts with a “sweet but salty, lye-coated pretzel” bagel to balance out the richness of Ben & Jerry’s ‘Double Caramel Brownie’, an exclusive scoop-shop flavor that consists of caramel ice cream with chocolate brownie chunks and salted caramel swirls. This bad boy is then drizzled with a gooey caramel sauce. The brand also left an interesting piece of trivia to tease this array. Founders Ben Cohen and Jerry Greenfield had originally intended to start a bagel business, but changed their minds and started selling ice cream instead. The rest is history. 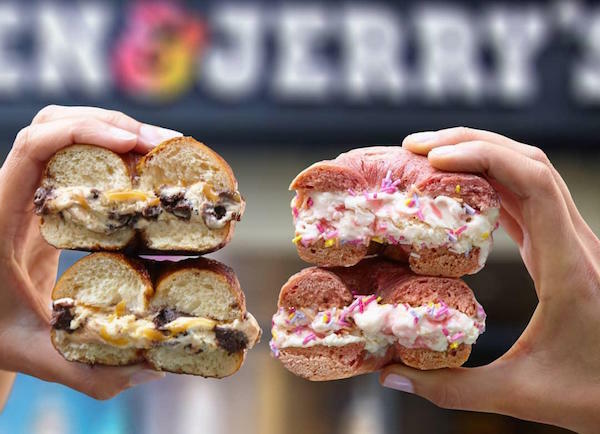 The ‘Ice-Ice Bagels’ are, sadly, only available at Ben & Jerry’s Soho location between 24 August and 9 September—but they make a great recipe idea for your next late night dessert. Introducing our FIRST EVER Ice-Ice Bagel! Click the link in bio for ice cream bagel EUPHORIA!